The day has come for me to post about all of the lovely creations myself and the other members of ‪#‎thebookclubcookbookCC made in March for A Tree Grows In Brooklyn. It seems like many of the others fell in love with the book too. No one made the recipe for Chocolate Russe from the invite post. I am still hoping someone tries it out soon but for now I am pretty satisfied with all of the inspired recipes. We had quite a feast. You might remember that I made Italian Sweet Rolls, a special treat for Francie and her brother as they ran errands for their mother. 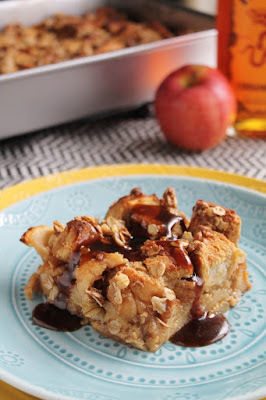 Erin from A Spiffy Cookie made a Boozy Apple Cinnamon Bread Pudding. She was inspired by taking stale bread and creating something amazing. Camilla, our fearless leader, from Culinary Adventures with Camilla, made a gluten free Cherry Chocolate Blossom Cupcake. She took note of the passage when Francie was daydreaming of fancy treats she might someday be able to eat. 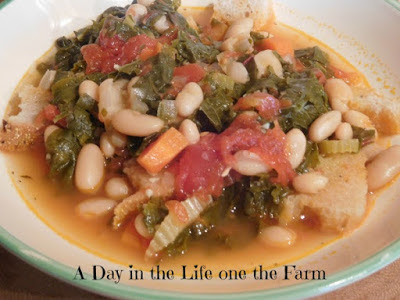 Wendy from A Day in the Life on the Farm, made something more practical with an Italian Vegetable Stew. This stew was packed full of veggies and bread. Although I am pretty sure Wendy didn't go to the store and ask for all of the old, wilted vegetables and stale bread for her recipe as the children did in the book. Sarah from Things I Make (for Dinner), whipped up some Crock Pot Baked Beans, hoping to feed us all something filling on the cheap and long lasting. These beans certainly fit the bill for the food trend in the novel. And finally Sarah, The Pajama Chef, made us some delicious coffee chocolate chip streusel mufffins. She pointed out the significant indulgence of coffee the Nolans had on a daily basis. Even though the children didn't enjoy it they cherished their cup knowing it was a treat. Thanks for joining me this month and be sure to check out next month's book choice with Sarah at Things I Make (for Dinner). Did you have a good Easter? We had a marvelous one. Lots of love with family. Brunch. Egg hunting and basket finding. Now are you wondering what to do with all of the ham? Well I have the perfect solution for you. These Hawaiian Roll Ham and Cheese sliders are a quick dinner. They make ham and cheese sandwiches a bit more special and are sure to please your hungry family members. I got this recipe from Lynsey at Lynsey Lou's. She was my secret blog for The Secret Recipe Club March posting. Lynsey has been cooking for a while, learning from your mom and grandma. She won her husband over with her good eats. I can see why. I found several recipes on her site which I knew would make my man pretty happy. When it came down to it it was between the ham and cheese sliders and the Pepperoni pizza monkey bread. We didn't have ham for Easter and this was a welcomed meal from my hubby to get his ham fix. I followed the recipe with the exception of adding poppy or sesame seeds. I am not really a seed fan. You can make these ahead of time and then just throw them in the oven when you are ready to eat. Perfect for a party or a quick dinner. I made these with frozen fries and a broccoli salad from the grocery store deli. Talk about an easy dinner. The sliders were amazing and really made the meal. Thanks Lynsey for such a yummy recipe! Split the rolls in half. In a small bowl combine mayonnaise and mustard and stir to combine. Spread the mixture on the top and bottom half of the rolls. Fold the ham in quarters and place on each roll. Top ham with cheese, followed by the top of the rolls. Place the sandwiches in a Pyrex baking dish that is slightly larger than the rolls. Place butter in a microwave safe bowl and heat until melted. Add the mustard powder, onion, Worcestershire and seeds and whisk to combine. Pour evenly over the rolls. Cover with foil and allow to chill for at least 1 hour, or overnight. Remove pan from fridge and allow to come to room temperature. Preheat oven to 350. Place the sandwiches in the preheated oven and bake for 10-15 minutes, until the rolls are golden brown and cheese has melted. Happy Easter! I remember a year ago Mr. J and I were still trying to figure out life with Miss O. We didn't do a thing for Easter except cuddly up and stay close to one another. Not a bad thing. This year though I full of ideas on how we can develop our own Easter traditions with our little one. I have a basket ready. We will have a mini egg hunt in the back year. Brunch. Most of our plans stem from my own memories growing up with Easter. However I want to add a few new ones as well. I am sure they will develop over time as we learn and Miss O grows. This year our "new" Easter tradition is Easter bread. A sweetened dough, braided and topped sprinkles, sugar, and a dyed egg. The egg was a bit much for me this year but we did have fun with sprinkles. *I chose not to use dyed eggs for my bread. If using, have dyed egg ready before you start the bread process. The Easter eggs do not need to be hard boiled. They cook when the bread bakes, just dye the eggs uncooked, without hard boiling them. Be careful they don't crack! In microwave safe measuring cup, warm the milk until just warm. Combine with the melted butter. In a large mixer bowl, combine yeast, salt, eggs and sugar. Add the warm (not hot - it will kill the yeast) milk and butter. Add about half the flour and beat until smooth with dough hook. Slowly add the remaining flour to form a stiff dough. Don't worry about how much flour it ends up being, just keep adding until the dough is no longer sticking to the sides of the bowl. Continue kneading until smooth. Place in a greased bowl, cover and let rise in a warm place until doubled, about an hour. Place on two baking sheets lined with parchment paper or Silpats. Cover and let rise until double, about an hour again. Brush each bread with the remaining beaten egg wash. Put on the sprinkles or sugar. If using eggs place one in the middle of each bread ring, making an indentation with the egg. Although the eggs are edible, they are really just for decoration. Only eat eggs shortly after baking, otherwise they need to be refrigerated if you plan on eating them later. Do not eat eggs if they sit out for a long period of time. Are you ready for Easter? I think I will be but right now I am no where close. My post today doesn't have anything to do with Easter but it did help me with my Easter planning. I am super excited for today's post. March was my hosting month for #‎thebookclubcookbookCC. You can read my invite post here. I choose A Tree Grows In Brooklyn by Betty Smith for the March book. 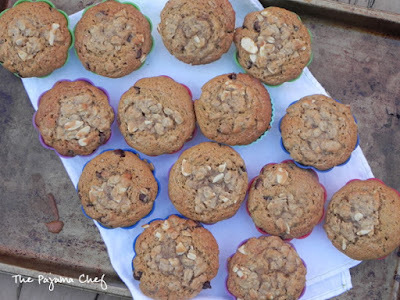 As you know, I and several other bloggers are cooking and baking our way through The Book Club Cookbook, Revised Edition: Recipes and Food for Thought from Your Book Club's Favorite Books and Authors by Judy Gelman and Vicki Levy Krupp. Each month the host picks a novel and recipe from the book. You can read the novel or not and to join you make a recipe, either from the cookbook, or your own inspired recipe. A Tree Grows In Brooklyn is all about Francis Nolan, her life growing up in Brooklyn at the turn of the century. I picked this book somewhat ignorantly. It's classic, at times controversial, but read widely in schools. I had no idea and had never read it on my own or in school. Luckily though I fell in love with the story and Francie. The book was somewhat long and I was a afraid with my busy baby life I wouldn't have enough time finish within the month. The book drew me in though as Francis grows up and explains the world around her. There are so many details. Too many to share. All I can say is I would highly recommend this novel. As for the food there are so many special and not so special moments that incorporate food. The Nolans were not rich and struggled to have enough food. They were creative with the meals they did have, and dreamed out foods they didn't. A Tree Grows in Brooklyn is a Food rich book. A special treat for Francis and her brother were sweet rolls. Although just a few pennies at the time it was still a stretch to buy, normally they waited for day old rolls to save a bit more. Sweet rolls were the destination of after work courting trip. These rolls came about as I was looking for some roll recipes for our Easter meal. The dough is rich from sugar and egg but comes together very easily. The smell will fill your house as you bake them off. I quickly ate three before they cooled and completely understood how Francie adored the rolls as an escape from her tough world. Be sure to check out the other bloggers participating this month. Combine the yeast, salt, eggs and sugar in the bowl of a standing mixer. Add the warm milk and half of the flour. Knead with the dough hook until combined. Add more flour gradually until the dough starts to pull away from the sides of the mixer. Knead the dough about 3-5 minutes longer, or until completely smooth and elastic. Gently deflate the dough with your hand. Turn it out onto a floured work surface and pat it down slightly so that the dough has an even thickness. Cut the dough into 24 even pieces. Roll each piece to form a ball. Cover the dough balls with plastic wrap and let rise again for 1 hour, or until doubled. Combine the egg and 1 teaspoon water in a small condiment cup. Using a pastry brush, lightly coat the loaves with the mixture. Bake for 15 to 20 minutes, or until the rolls are golden and fragrant. Let cool until warm. Sprinkle with powdered sugar or top with a glaze if desired. As this month's host, I, am giving away a copy of the book. * Enter to win a copy of the cookbook so you can join us in future months, if you wish! One of our lucky readers - US and Canada only! - can enter to win a copy ofThe Book Club Cookbook, Revised Edition: Recipes and Food for Thought from Your Book Club's Favorite Books and Authors by Judy Gelman and Vicki Levy Krupp, courtesy of Tarcher-Penguin. Giveaway runs from March 1st till March 31st at 6 o'clock PM, Pacific time. Please see terms and conditions in the rafflecopter widget below. Many thanks to Tarcher Books. You may find Tarcher: on the web, on Facebook, on Twitter, and on Pinterest. *Disclosure: I received a complimentary copy of The Book Club Cookbook, Revised Edition: Recipes and Food for Thought from Your Book Club's Favorite Books and Authors by Judy Gelman and Vicki Levy Krupp as an opportunity to give a copy away. Opinions are our own. We received no further compensation for our posts. Oh man has it been some weeks. We had 60 degree temperatures and then snow yesterday. We are all fighting colds and Miss O got two ear infections again. I am praying the warm temperatures reappear for good. And that brings better health to all. Way back before we all get sick my in-laws came to visit. My MIL was celebrating her birthday and we made cupcakes. These are pretty basic chocolate cupcakes with a easy chocolate buttercream frosting but they were so, so good. I wish I had a chocolate cupcake available to me each and every day. Mr. J swears he is not a fan of cake but he had one of these every day till they were gone. He was a bit sad the day after he consumed the last one when there was no more to enjoy. Note to self: Make more cupcakes! Mix in the butter on low speed, until the mixture resembles moist crumbs. Stir in the eggs, yogurt and vanilla, scraping the bottom and sides of the bowl to be sure all the ingredients are well-combined. Fill lined cupcake wells just over half full (approx. ¼ cup of batter). In medium saucepan, melt chocolate chips and butter over medium low heat, stirring frequently. When melted through and combined completely, remove from heat and chill until solid. My little baby turned one last weekend. I am still coming to terms and processing this fact. How has it been a year already? I found myself replaying every moment of the days leading up to her birth, the event and the weekend after. So much happened in such a short period of time. Here we are a year later and it is like Miss O has always been a part of our family. I cannot imagine our life without her. To celebrate such a momentous occasion I wanted to make a very special treat. Miss O has had limited sugar and no cake up until her first birthday. I wanted her first cake to be fabulous. I searched and searched and came up with a vanilla bean cake. I had vanilla beans just waiting to be used and I couldn't think of a better way than for a birthday cake. Daddy scraped the vanilla beans and I prepped the batter. Everything came together nicely and we frosted the cupcakes as Miss O napped the morning away. We decided to have the cupcakes in the afternoon. We got all set up, cameras ready. Miss O immediately went for her cupcake top first, getting frosting all over her hands. The sticky, gooey frosting stuck to her fingers in a way she didn't quite enjoy. After breaking up the cupcake a bit and trying to get her to at least taste the sweetness we gave up. Miss O would have none of it. I was left seriously questioning how this could be my daughter. Don't judge these cupcakes based on Miss O's reaction. We thoroughly enjoyed them. Heat the oven to 375F. Line a 12 cup muffin tin with liners. Set aside. Split the vanilla bean lengthwise and scrape the seeds as much as possible from the vanilla bean halves. Add the vanilla seeds to the creamed butter. In a small bowl sift the flour and baking powder together. Add the flour mixture to the mixer alternately with the milk. Beat until just combined. Pour batter into the lined muffin tin. Bake in preheated oven for 15-20 minutes. Remove the pans from the oven, let the cakes cool for 5 minutes in the pan, before transferring to a wire rack to cool completely. In a mixing bowl add the butter. With the paddle attachment on, beat on low speed until light and fluffy about 3-5 minutes. Add the vanilla seeds to the creamed butter using the method above. Gently beat in the powder sugar, a little at a time. When all the sugar is added, increase the mixer's speed to medium-high and beat for 2-3 more minutes. Add a few drops of heavy cream until you reach the desired consistency. I just realized that Easter is coming right up at the end of the month. I could be totally cliche and say that time is flying by. I won't. But it is. Also in March we can celebrate Pi Day. March 14th or 3/14 is quickly approaching too. I don't do pie too often. Give me a cookie or cake any day. Pie I can decline and not regret the decision for the rest of the night. Mr. J however loves pie. Mainly apple. He is also a fan of custards. I am much more fond of custards than apple. Plus I am always up for a new recipe. I was eyeing Chess pies for a while. Hearing and seeing that they were wonderful, but never trying them myself. Well due to Easter and to honor Pi Day I decided it was time to make some pie. I went with a classic buttermilk version; however, there is also a chocolate version or you can make the classic with regular milk. There are staunch supports of each on the web. As for pies I quite enjoyed this one. Be sure to have your sweet tooth ready because this pie is definitely sweet. Buttery and gooey too. I put this pie together in about 10 minutes. Just in the nick of time before Olivia decide she wasn't going to have her nap for the day. I enjoyed it warm but Mr. J preferred the chilled version the next day. Either way it was a good choice for my occasional pie making days. Heat oven to 350. Combine sugar and flour in a large bowl. Add eggs and buttermilk, stirring until blended. Stir in melted butter and vanilla. Bake at 350 for 45 minutes or until set. Cool on a wire rack at least an hour before serving. Store leftovers, well-wrapped in refrigerator. A hearty casserole of potato, sausage, egg, and cheese. Sure to make everyone's morning a bit more delicious. I am here today with another casserole. Sorry I couldn't have given you a heads up yesterday. Mondays are hectic for us. And this casserole is going to save us from making breakfast a big to do this morning. Although this casserole is a cinch to put together it does time a while to cook. I recommend enjoying a piece of this casserole on the weekend for a leisurely brunch and then taking advantage of the leftovers during the week. Of course you could make this as a crowd pleaser for Easter. We might be doing just that ourselves. You can make mix all of the ingredients together the night before or wait till morning. Either way the longest part is cooking the sausage. We enjoy a good breakfast and this Hash Brown Sausage Egg Bake Casserole does not disappoint. I stopped myself from eating more purely to have some left for Monday. Not a sausage fan? Don't forget about bacon. You can easily switch out the sausage for some bacon. In a large bowl, combine the hash browns, sausage, 1/2 cup cheese and salt. Spoon into a greased 13-in. x 9-in. baking dish. In another large bowl, beat eggs and milk until blended; pour over hash brown mixture. Sprinkle with paprika. Bake, uncovered, at 350° for 45-50 minutes or until a knife inserted near the center comes out clean. Sprinkle with remaining cheese.